Did it start in 2012 when the Ohio State Buckeyes robbed the Oregon Ducks of highly touted all-purpose back Dontre Wilson right under their noses? Or did it begin before that when Ohio State out-recruited Oregon for top high school prospects? Either way, the 2015 recruiting class will not be different, with the Buckeyes winning this contest by a large margin — again. 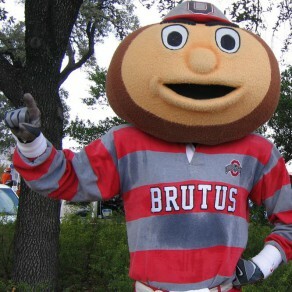 Brutus says the Buckeyes are #1. The only stretch was in 2011 when Oregon brought in its best recruiting class since the beginning of the BCS era. One site, rivals.com, had Oregon ranked #9 and Ohio State #11. There it is. That’s it. The other two major sites, scout.com and 247sports.com, had the Ducks ranked #13 and #11, respectively. The Buckeyes looked much better on those two sites, ranking at #6 and #7, respectively, above the team in green. On paper, Urban Meyer’s team is tops and Oregon does not hold a candle to it. In fact, in the 2011-2014 classes, Oregon was only able to bring in a single 5-star athlete each year, totaling a whopping four 5-star recruits. Well, Ohio State tied that amount of 5-star blue chippers twice in a single season. In 2012, Meyer not only stole away 4-star Wilson from Oregon but also added four 5-star studs. Then four more in 2013. Since 2012, the Buckeyes have not only won the battle for 5-stars but has doubled the number of 4-stars the Ducks have brought in, with the exception of 2012, when Oregon had nine while Ohio State only signed 11. Since then, OSU has welcomed 17 4-stars in 2013 to Oregon’s eight; 16 to eight in 2014; and currently Ohio State has 12 verbally committed 4-star prep stars to Oregon’s six. Ouch! The talent runs thick in Columbus. For those of you who don’t like the star system and want to know where each player ranks in his recruited position, I looked at that too. Again, Oregon comes up short. On scout.com the list shows the individual ranking of each athlete, and the Buckeyes pick up many more top 10 studs at their specific positions. For example, punters are never ranked higher than 3-stars. However, if you recruit the top punter in the nation, you win that recruiting battle over everyone else. Currently, the Ducks have four players committed that are ranked in the top 10 for their positions. This is the most in the last five years, with only three signing in each other year except 2012, in which the school signed only two. Ohio State, on the other hand, dominates again in this stat, with exception to the current class (which isn’t complete yet). The only similarity is that 2012 was the Buckeye’s worst year as well, in which seven top 10 positional guys were signed. 2011 and 2013 were identical with eight top 10 players signing with the Buckeyes, and last year’s class topped them by bringing in ten. This #8 should not have the ball – its Reggie Daniels taking the ball from #4 Dalvin Cook. Clearly, Oregon sits in the shadow of its national title opponent in recruiting terms, but it stands on the same stage before this matchup of super teams. Unless I haven’t convinced you yet that the Ducks just don’t get the highly touted and sought after, NFL-ready players, I can look at the top three recruiting sites and see how they have ranked the two schools the last five years. The rankings always vary some but are always pretty close. In the order, I will list just the numbers for each year for the two schools on rivals.com, scout.com and 247sports.com. The two most distinguishing years are 2013 and 2014 when Oregon signed the #22, 17, 19 (rivals, scout, and 247) and #26, 22, 21 classes, respectively. However, Ohio State ranked at #2, 1, 2 and #3, 5, 3 classes. Two top 25 classes compared to two top FIVE classes. This is the bulk of each semifinalists’ winning team. Obviously, the Buckeyes have the upper hand in talent and should be able to blow the Ducks up on the field. With less than a month left in the 2015 recruiting cycle, Ohio State is far ahead of Oregon with a top seven ranking currently, while the Ducks’ new Ju-co commitment puts them floating around #20. I don’t see huge interest from any 5-star prep players for Oregon, and for the first time in several years I don’t foresee the Ducks landing any of them. Oregon can’t win this battle. I don’t want this whole article to be a downer for Duck fans, so I will mention one more thing really quickly regarding an article I read about the title game matchup by an ESPN writer, KC Joyner. According to Joyner, “Ohio State should be favored over Oregon in national championship based on stats.” I read the introduction to his stats and couldn’t read any more. Well said, Mr. Joyner. However, did you even take the time to look at the other side of the stats of these two facts? Apparently not. I realize that Ohio State only has the longest win streak now because Florida State’s 29 game streak came to an end… against Oregon. If the Ducks can take care of a 29 game win streak, why should they be intimidated by 12? Also the 101-35 in the Buckeyes last two big games is close to Oregon’s 110-33 combined score of the Pac 12 championship game and the Rose Bowl, but not as good. Weird facts to try to state a “strong” case for an argument. Oregon just laid the wood to a far better recruiting machine in Florida State, which had a top three class last year and the #1 class in 2011. 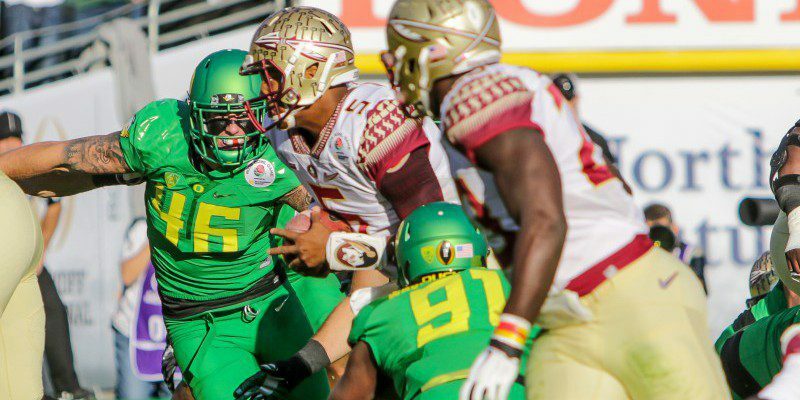 If the Ducks play another in Ohio State, they will still have a great chance to win. So, the recruiting winner in the end will be Ohio State — again, but on the field, Oregon has it where it needs it.